Freshwater, algae-eater shrimp. It is peaceful and quiet. Requires a richly planted tank with plenty of hiding places made ​​up of bog wood or rocks. Although it is not social, it is advisable to raise at least 4 together. 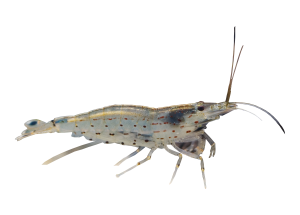 It feeds on algae and, if brought together to fish, feed forward, but it is good to provide one to two times a week special granular food for shrimps, small amounts of blanched zucchini and frozen Chironomus. Should not be kept with voracious or aggressive fish. Sometimes feeds on fish eggs. Reproduction has a mortality rate of 99% of the planktonic larvae in fresh water: in fact, the larvae should be increased with liquid food in brackish water (density 1010-1015): in nature, the larvae are carried by flow to the mouths of rivers.